Recorded by Bob Dylan, Malibu, CA, May 1993; released on "World Gone Wrong", Oct 1993. 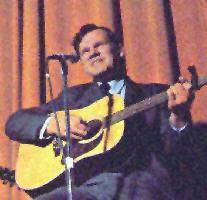 Source: Doc Watson, vocal/guitar (with Gaither Carlton, fiddle) on "The Doc Watson Family" (Folkways FA 2366, 1963; CD reissue -- with additional tracks -- Smithsonian/Folkways SF 40012, 1990). "How sweetly I sleep here alone. But calm is my feeling, at rest is my soul. Has kindly assisted me home."